EXTRA COLOURS: This product is available to order in a bespoke RAL colour of your choice. Please mention RAL colours in the comments field when placing your order and we will contact you for details. Delivery times might vary and there will be a 10% surcharge on the net price . All steel construction. 250kg capacity Pneumatic tyred truck for all terrain use. Powder coat finish Scratch resistant. Available in Blue. Wheel diameter 260 x 85mm Dimensions 1150mm(H) 620mm. What is the purpose of a Pneumatic Folding Toe Sack Truck? A Pneumatic Folding Toe Sack Barrow is versatile transporting equipment that helps move stocks from one location to another. It is useful in many commercial, industrial as well as home applications. The sack barrow is a hand-pushed truck that can be easily manoeuvred through narrow hallways indoors as well as lanes outdoors. 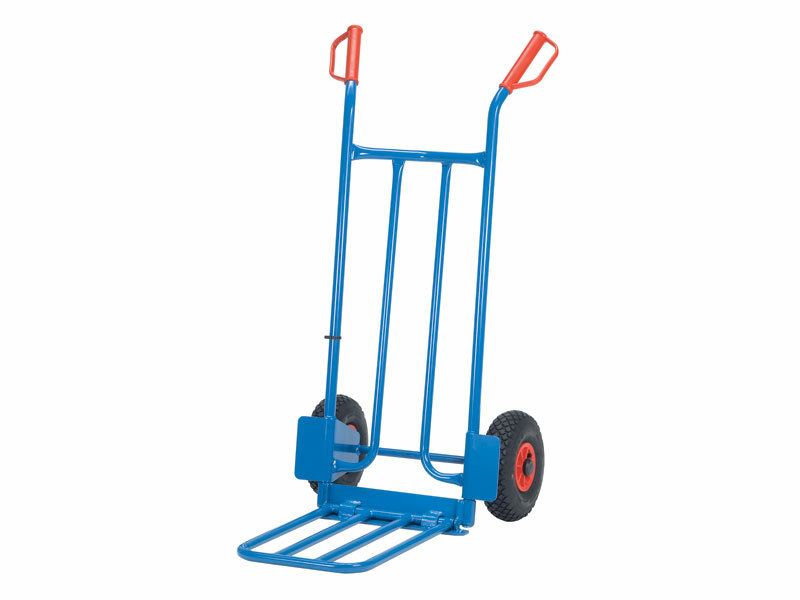 Its pneumatic tyres make it ideal for heavy loads, allowing users to carry sacks, boxes, garden materials or warehouse inventory effortlessly. Where can a Pneumatic Folding Toe Sack Truck be used? Sack Trolleys are most useful in warehouses, parks, gardens and even homes. It is vital moving equipment in schools, restaurants, groceries, nursing homes, laboratories as well as supermarkets. This sack truck is likewise a valuable tool for dispatch and storage facilities. One can find a myriad of uses for this versatile moving tool also in airports, hotels and activity centres. Who might use this hand trolley? Members of staff involved in carrying stocks from one location to another utilise the sack trolley in their daily functions. These members could be dispatch or warehouse personnel, restaurant or diner staff, administration aides in charge of supplies, library and bookstore assistants. Grocery operators utilise the sack truck while replenishing their store’s stocks every now and then. Concert and banquet organisers move their wares around their activity venues with this product. The Pneumatic Folding Toe Sack Truck is ideal for gardeners and park maintenance workers because of its tyres that can withstand wear and tear from heavy outdoor use. This product is built of strong steel materials powder-coated for that non-scratch, durable finish. It is equipped with quality gauge 260mm x 85mm pneumatic tyres for controlled manoeuvrability when loaded with heavy goods or materials. The lifting blade which is 500mm (L) x 330mm (W) is collapsible for convenient storage when not in use. The footplate is 150mm (L) x 400mm (W) while the loading capacity of the sack truck is 250kg. The Pneumatic Folding Toe Sack Truck has dimensions of 1150mm (H) 620mm (W).